When politicians invoke the “threat of radical Islam,” this typically features imagery of automatic weapons, plane crashes, and IEDs. Michel Houellebecq’s novel Submission suggests an alternate, perhaps more powerful arsenal: textbooks and bank deposits. The battleground is France, the year, 2022. In a series of swift political negotiations, the Muslim Brotherhood attains power in that year’s democratic elections. In comes the new normal, complete with polygamy, limits on women’s freedom, and professional success contingent on converting to the faith. The novel generates its effective, dark humor through the vehicle of its narrator, Francois. He’s a middle aged professor who has attained every reasonable measure of success in the world of literary academia. Yet we meet him trapped in a funk of boredom and complacency. The turbulent cultural shift around him continues to unfold, but Francois insists that as a mere university professor, there’s a layer of insulation between himself and his country’s dramatic shift. Early on, when civil unrest at voting stations start moving toward a Walking Dead-style anarchy, Francois still ponders where he might indulge in some foie gras. Francois soon realizes his vocation, in fact, lies in the heart of Islam’s intended battleground: education. Rather than territory siege with an armed front, the Islamic regime seeks to solidify its position in future generations by focusing on the education system and the birthrate. The Islam faith becomes conditional for a professorship, and female students’ opportunities are severely squeezed. The Islamic mindset couldn’t be farther from Francois’ established identity and habits, but he is nonetheless cornered; in order to continue life as he knows it, he must submit. The true terror in this narrative lives within the cost-benefit analysis of his options: As an established professor (and a straight white male), the deal available to him is quite persuasive. It comes complete with a prestigious teaching post, an absurdly high salary, and two (or more!) teenage wives. The arc of Francois’ dilemma is not unlike that of 1984’s Winston Smith, but instead of brainwashing and torture, this protagonist is courted and persuaded without any foul play. Plus, it’s not just the riches and beauties that compel him. As the societal transformation develops, Francois gradually meditates on the possibility that freedom and decadence are a failed experiment, that perhaps the practices of Sharia law have had things figured out all along. 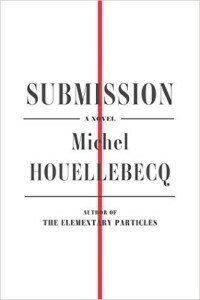 Houellebecq’s novel is concise and sharply elegant. Readers will confront uncomfortable realities presented in a darkly funny context. However, it’s stretch to call this a cautionary tale. There’s no plausible risk that a society as progressive as France could, in a span of months, wind back its cultural progress by a thousand years. Also, of all territories, why France? It is odd that a novel of this subject matter would be current enough to reference sitting president Francois Hollande, yet omits France’s 2010 law banning the burka. 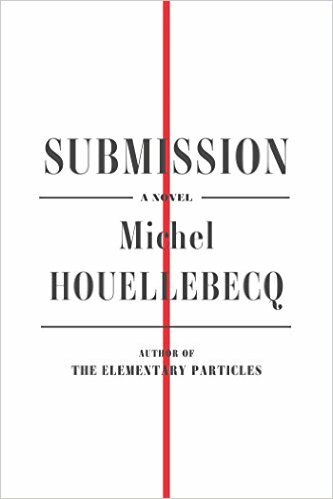 France may not be the most plausible territory for a political Islamic siege, but this is nonetheless Houellebecq’s native country, and this novel is (deftly and pleasingly) translated from the original French manuscript. Barring some convoluted analysis regarding France’s parliamentary structure, native English readers likely won’t feel that anything was lost in translation. Despite its brisk length, Submission wanders down some varied corridors, yet never feels slipshod. Francois has encounters with prostitutes, reflects on the finer points of his academic achievements, makes a sojourn to a monastery, and gossips with his colleagues about who’s moving up in the department. The sum of these encounters pose some oddly persuasive notions: Is atheistic materialism a dead end? Are there comforts to religious devotion, released from the temptations of freedom? Though these questions can’t be examined in a black and white fashion, Submission presents a narrator who does so anyway. This novel packs a punch that is at times uncomfortable yet hilarious, and is ripe for a book club willing to wade into its murky ethics.